Originally the Lewis & Clark expedition discovered the river area on May 20, 1805 naming it “Muscleshell.” In 1877 a trading post, called “The Crossing” was established across the river on the opposite side of present day Musselshell. It included caves cut into the north bank along the river. It was located on the Fort Custer – Fort Maginnis Road, which ran through “Old Roundup” located south of the river in 1882. Essentially this was on the northern border of Yellowstone County at the time. Within eight months, Roundup grew from a sage-brush flat on the south side of the Musselshell River, to a large community of about 1,200 persons. On April 10,1866, Muscleshell County was created by the second territorial legislature, and it covered a vast area, but Roundup was still in Yellowstone County. Kercheval City was named its county seat. On November 11, 1866 the third territorial legislature changed the county name to Vivion, and moved the county seat to Smithton. The name of both new counties, and their county seats were never published. Through an extraordinary session in Washington D. C. called by an Act of Congress on March 3, 1867 (ref: 14 U.S. Statutes 426-427) the transactions of the Montana legislative body were annulled, leaving the territory county boundary lines unchanged. Roundup later repositioned itself to the north side of the river when the railroad passed through. This created at first a great influx of homesteaders, who later discovered that this was cattle country, not farmland. Coal miners were employed by the hundreds to feed the train engines, and the population expanded. The trains shifted from coal to diesel around 1920, and the population started to drift away. In November 1919, the Van Duzen Oil Company struck oil at Devil’s Basin. Although it was not commercially profitable, it did pave the way for the eventual discovery of several oil fields north of Roundup. On February 11, 1911 the name Musselshell appeared, when the new county was created from parts of Fergus, Yellowstone and Meagher Counties. This action moved the northern boundary of Yellowstone Valley southward towards its present location. In 1917 Roundup was designated county seat for Musselshell County, changing the Rosebud County line. In 1920, Golden Valley County was created from Musselshell County. 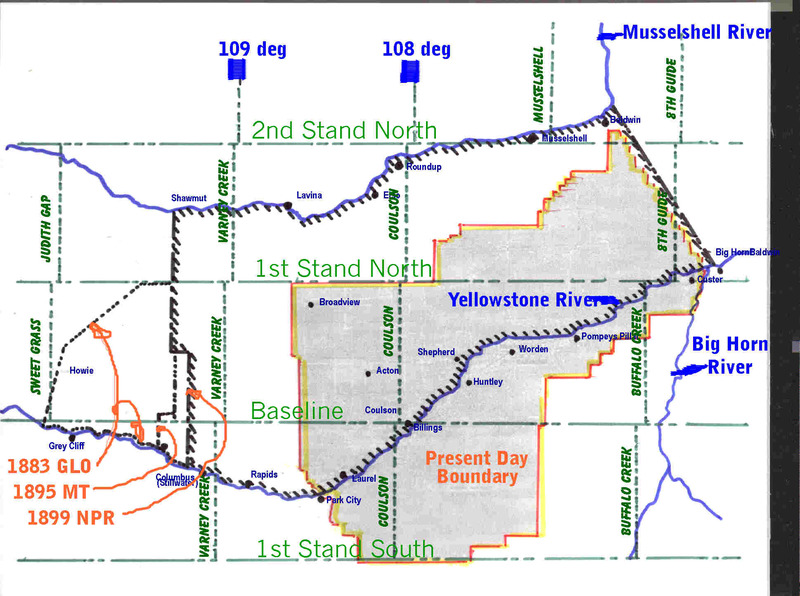 The pre-present day boundaries were between the two rivers, (Yellowstone and Musselshell) with minor extensions as shown to the west. The portion of Yellowstone County shown south of the Yellowstone River was added to the maps after 1906, when Crow Reservation land (1,150,000 acres) was attached for settlers. ü 1883 GLO. Refers to the General Land Office published map of the 1882 formation of Yellowstone County from Custer and Gallatin Counties. ü 1895 MT. Refers to Montana State published map. ü 1899 NPR. Refers to The Northern Pacific rail map and the Montana state Map. After the county was established, the businessmen looked for various ways to gain more land. Initially it was the railroad construction to Red Lodge that offered an “excuse” to try and get the panhandle area of Park County added to Yellowstone’s. Red Lodge was in Park county, and the center for the coal mining district. 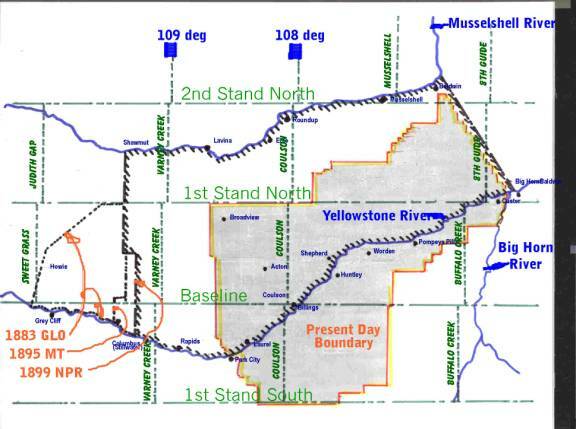 Park County fought the measure based on the fact that their mill levy was lower than Yellowstone’s and that a strip of Crow Reservation land existed between the two counties. The annexation was defeated. In 1890 there were only 2,065 people (1,242 males) in the county, and this didn’t look good. The county had about 3,420 acres of land. In 1891 there was an attempt to change the boundary lines and enlarge the land holdings. This happed through Red Lodge & Park County. Red Lodge citizens requested that a new county be created for the. This failed and they then asked that they be annexed to Yellowstone. A bill to do just that was introduced to the legislature, but before it could be acted upon a new treaty with the Crow Nation was created, and this action stopped all annexation. On March 3rd, 1891, Congress approved the Crow Indian Treaty that was made on December 8, 1890. This opened for settlement part of the Crow Reservation lying west of the divide between Pryor Creek and Clark’s Fork. After this bill was ratified by Congress only two days remained before it would be required that the Montana Legislature adjourn. A bill was immediately introduced in the senate dividing the Indian land between Yellowstone and Park Counties. Most of the land went to Yellowstone County. The measure was passed the same day with a vote of 10 to 4. The bill was sent to the house, and they amended I on March 4th by giving the greater portion of land to Park County. The dividing line was run due south from the junction of the Yellowstone River with the west boundary line of Park County to the Wyoming border. A motion to stop the action was introduced, but lost out. The bill passed and was forwarded to the senate. They refused the amendment, and asked the house to recede. They wouldn’t, and the bill itself was lost. Earlier, in the legislature meeting of 1885, they passed an act “providing that part of the Crow Lands lying west of the Big Horn River should become part of the Yellowstone County when it was opened for settlement.” By having the 1891 legislature stalemate the bill to separate the Crow Reservation into two parcels, automatically placed all of these lands into Yellowstone County. In 1892 President Harrison proclaimed that 1,800,000 acres of the reservation lands were opened for settlement, it became attached to Yellowstone County. This gave the county a total acreage of 3,988,000 (6,232 square miles.) In addition, over one-half of the land was on the south side of the Yellowstone River. In 1892, during the next legislature meeting, an attempt was made to form a new county [Sweetgrass] from these lands. The attempt failed, and Yellowstone County held onto the land mass until 1895, when it lost all of its gains from the 1891 fiasco. 1893 was considered “hard times” for Montana residents. Prices fell, but the banking industry held firm. A railroad line extending from Sheridan, routed through Huntley, and on to Billings was established the following year. On October 4th, the first train made the trip. Although business started to pick up, in 1895 Carbon and Sweetgrass Counties were created from the land acquired by Yellowstone through the 1865 legislature action. Creation of the new counties created a small strip of land on Meagher County, and on March 5, 1895 this small piece was given to Yellowstone County. This land was located from the divide between Pryor Creek and Clark’s Fork and the Carbon County line. In 1900 Yellowstone County had about the same boundary area as in 1890. In 1904 Congress created an act that provided for the purchase of 1,053,000 acres of Crow Reservation land…. In 1905 it was reported [April 1905 – Billings Gazette] that the increase in sheep raising has had an effect on the cattle losses. It was a former practice to raise sheep on the open ranges for both winter and summer times. The winters were hard on the sheep, and losses were heavy. This practice changed, and the sheep were placed on the ranges during the summer months, and wintered in pastures on alphalfa during the winter. Billings alone wintered about 250,000 head. In 1906 Congress opened the land for settlement, and they then became an official part of the county. In 1907 Senator Annin called for the creation of Roosevelt County, with the land to come from Yellowstone. The bill failed to pass. Members of the Council were: Phelps, McCormick, Dance,, Leavitt, Merriman, and Potter. Extracted from “Part V, An Illustrated History of Yellowstone Valley”, State of Montana, Spring 1907.